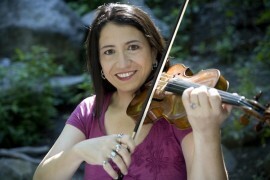 Violinist Suzy Perelman began her study of the violin at age 6 in the Philadelphia public schools. For college Suzy attended the Cleveland Institute of Music (Bachelor of Music, 1994), Case Western Reserve University (Bachelor of Science in Music Education, 1995), and Carnegie Mellon University (Master of Music, 1998). Her teachers were Linda Cerone, Bernie Goldshmidt, David Updegraff, David Russell, and Andrés Cardenes. Following school, Suzy played with the Utah Symphony in Salt Lake City, and then the San Antonio Symphony. She left San Antonio to become the concertmaster of The Phantom of the Opera national tour, on which she traveled for 2 years. Suzy moved to NY 5 years ago and began playing on Broadway. She has played in several shows in cluding Chitty Chitty Bang Bang, LoveMusik, The Color Purple, Legally Blonde, Chita Rivera, South Pacific, 9to5, Phantom, and A Little Night Music. Suzy is a member of the Brooklyn Philharmonic, and can also be heard playing in several other orchestras in the NY area. Suzy is a trained Suzuki Violin teacher and is very proud of her 12 young private students! When not practicing, performing, or teaching, Suzy enjoys rollerblading, flying trapeze, playing games, Israeli folk dancing, emailing, TRAVELING, hiking, and spending time with family and friends.